The Holiday Season is upon us and we have been having some great wines this December. Including a lovely 2009 Etude Pinot Noir with Christmas Dinner. 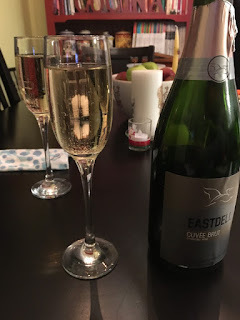 As part of our celebrations we received from Lakeview Wine Co. a Mommy Mix Gift Pack which contains a bottle of 2011 EastDell Cuvée Brut and a bottle of 2016 Lakeview Vidal Icewine (plus a two bottle winebad to boot). It would make a great gift for New Years or anytime frankly and certainly doesn't need to be limited to Mommy's but hey let's give Mommies their due. Lakeview Wine Co. is based in Niagara-On-The-Lake (NOTL), Ontario which is one of our favorite wine regions to visit. This area is very popular as a wine destination in Canada but is still a hidden gem for many wine lovers. 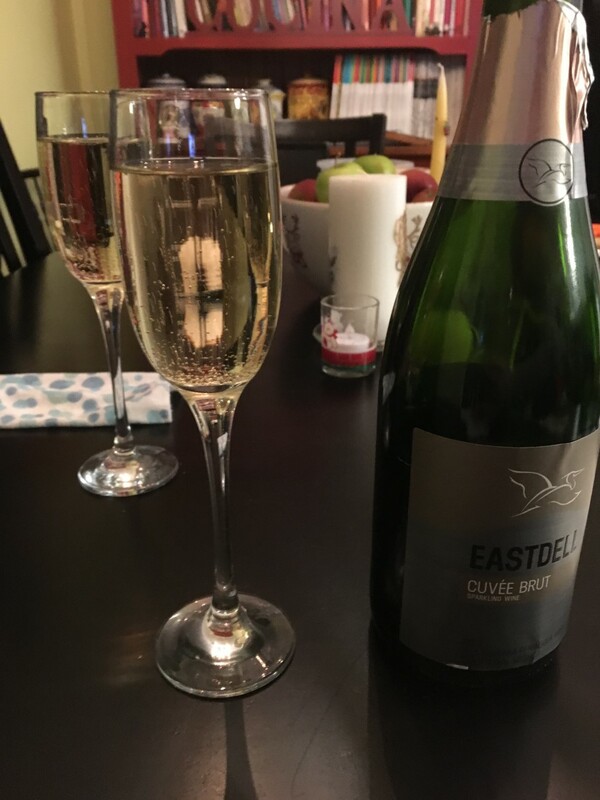 We started our meal of turkey leftovers with the 2011 EastDell Cuvée Brut is a blend of Pinot Noir (55%) and Chardonnay made in the Traditional Method. The nose on the wine is very fresh with a bright citrus nose which opens the sinuses. The smells are pear and peach with a layer lemon zest. The bubbly has a lively effervescence to it and it is very pale yellow in the flute. On the palate the wine has strong pear and apple notes with a slightly yeasty note at the mid-palate and a very, very clean finish. It was a really nice sparking wine and as a dry wine the flavours are soft and the acid crisp but refreshing. This is a well made sparkler and would make a great addition to any New Years Eve party and at just under $25 it punches well above it's weight. Very high quality work here in the fields and in the winery. If you're looking for a good toast to the New Years sparkling wine then this one will more than do the trick. 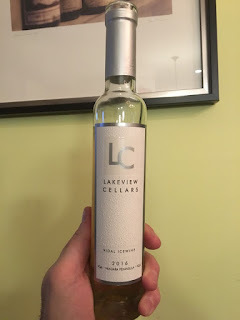 We finished our meal with the lovely 2016 Lakeview Vidal Icewine. We are not huge dessert wine drinkers as a rule but this wine WAS dessert tonight. As one would expect from an Icewine it was syrupy and thick in the glass but not overly so (thinner than maple syrup for sure). This version was also quite pale and not a golden colour as some might expect. Call it a slightly lighter version of an Icewine which can vary greatly in both viscosity and colour, like most wines. There are strong notes of honey, apricot and gooseberry on the nose with the start of a smell of lychee fruit that follows quickly on the palate. This is a dead giveaway for this being a Vidal Icewine. The sugar is high as one would imagine but there is some baked apple in there and a hint of acid at the finish which takes this away from being the one note of sweetness and really makes this a winner. This required a couple of tastings to really pick up all the notes but the lychee and a pronounced Welch's white grape juice flavour part way through make this quite nice as a meal finisher. It would also be great on Ice Cream were one so inclined. So, if you are entertaining this New Years and feel the need for some bubbly and something to go with coffee and dessert, then these are two solid choices to make to bring in 2018. From us at Unfussy Wine to you and yours, may you have a Happy New Year and a wonderful 2018.